Road to the Isles performs the pipe and fiddle music, dance, and folksong traditions of Scotland & Ireland and will transport your audience to the lochs and glens of the Celtic lands of old. 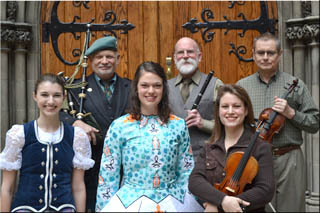 The group's six performers contribute their talents on the fiddle, flute, pipes, guitar, and with vocals, Irish Step dancing and Scottish Highland dancing. Dance performances include the sword dance, highland fling, sean triubhas, Irish reel and jig, slip jig, and hornpipe, all complemented by songs, stories, and instrumental solos and duets. Concerts usually consist of two sets with costume changes, solos, duets, trios, and ensemble performances, with raconteur and master musician Richard Hughes serving as guide through this beautiful territory. This show's theme focuses on the cultural relationship shared by the Irish and Scottish people, who share many ties, as well as contrasts, in their music and dance. Road to the Isles welcomes two exceptional fiddle players to the ensemble: Melinda Crawford, 2003 U.S. National Scottish Fiddle Champion, and Oliver Browne, outstanding Irish-born fiddler. Read the Road to the Isles Press Kit here or download it in pdf format. Educational presentations cover a wide range of elementary school assemblies, with a trio ("The Wind that Shakes the Barley") of piper, Irish step dancer and Scottish Highland dancer showcasing bagpiping, traditions and lore, and Irish and Scottish dancing. Study guides are available for educators to supplement their students' experience. Road to the Isles also offers workshops or master classes on fiddle, flute, and/or bagpipes as well as Irish step dance and Scottish highland dance. Promo kits and photos are available for Road to the Isles's school presentations and concerts. Road to the Isles also provides a DVD for presenters, and CDs for your continued enjoyment of their music and song.